“I am a senior woman who had a 10 ounce silver bar to sell. I called Beck Gold & Silver Brokers to get a price. They quoted me 198.00 for my bar right over the phone. I drove down Stony Plain Road and noticed another Alberta Bullion dealer so I stopped just to compare with Beck’s. The man at the counter looked at my bar and said he could give me $100.00 for the bar. I told him I was not interested in selling and I went straight to Beck’s. “Hi, I would like to share my experience with ‘Beck Diamonds’ . If you’re anything like me, you’ve been dragging around that old jewelery box filled with broken chains, one earring sets, and jewelery that just isnt’tto your taste any longer. I saw the loud ads on T.V., but refused to put my valuables into an envelope and send them to who knows where for a vague estimate and no real guarantee of ever seeing the items again if the cheque they sent was an insult. I looked into a few options; Money Mart, gold buyers, and worst of all, pawnbrokers but found none of these satisfactory. Then I made an appointment with Beck Diamonds and was pleasantly surprised. Finally someone took the time to look over all my pieces and gave me the option of choosing whether or not to sell each piece. At no time did I feel pressured to sell, and the price paid for my valuables was quite fair. Finally, I can spend money that really was collecting dust on more stuff to collect dust. However, now it’s stuff I want!! Thanks for a pleasant experience and I look forward to dealing with you again. “Hi Clinton, I was very impressed by my experience of meeting you, and how professional you were in the sale of my bracelet. I will definitely refer you to other people who could use your service. All the best in the New Year. Your professionalism made the process worth telling all my friends and family about your business. I look forward to our many dealings in the future. Mr. Beck came to my house to view a diamond ring that I was trying to sell. I had taken it to a few jewelers who offered me $150.00 and $225.00. A local pawn shop offered me $75.00. I knew that this was a complete rip off. Mr. Beck came to my house and paid me $700.00 for the ring. I was hoping for $850.00 but this was definitely the best deal. I would recommend his service to anyone. “I was at your place on Monday ( I had the silver wear set and loved all your furry friends) I just want to thank you for everything and the advice on where to sell my silver wear set. I have been telling all my girl friends and we are all very excited to have a party. “I had a couple of pieces of unwanted old gold jewelry. Recent news reports talked about the current high value of gold on the market and explained that local jewelers will buy unwanted jewelry. 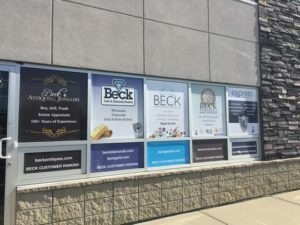 I used the internet to find a few alternative jewelers and found that Beck Diamonds gave an accurate weighing of the jewelry and a very fair price (considerably more than the alternatives) using gold market rates. Beck Diamonds was very professional to deal with and I recommend them to anyone. It was a pleasure to meet you today and I want to thank you for your very generous donation to Jessica’s Wish for our major fundraiser to be held on Sept. 4th, 2011. I know it will be a wonderful auction item and will help us to raise more money this year.